I asked 30 IT executives what they learned from their private cloud efforts. They shared surprisingly similar set of "key competencies" needed to achieve success with their datacenter transformation. Net take away? Don’t tackle private cloud from the “virtualization up” perspective. Do follow a “service design down” approach in order to get it right the first time. Also consider that if you build a private cloud that delivers what public cloud IaaS vendors already offer – you miss a great opportunity to drive your business forward. 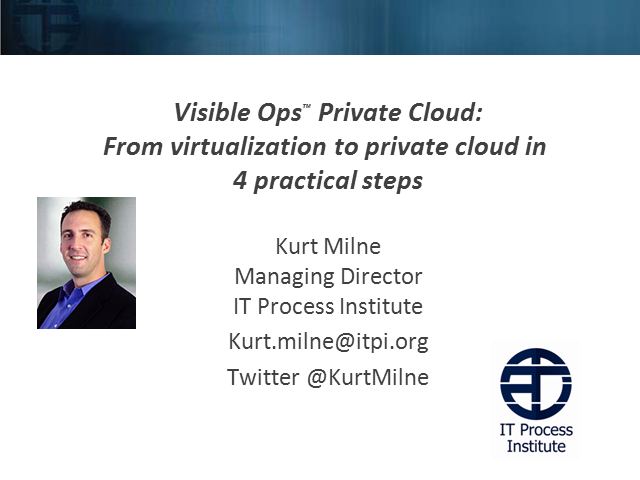 In this webcast I’ll share key take-aways and practical guidance from my recently released book “Visible Ops Private Cloud: From virtualization to private cloud in four practice steps”. - Ways to gain acceptance for a service-centric shared-resource model from both business executives and users, and IT personnel.